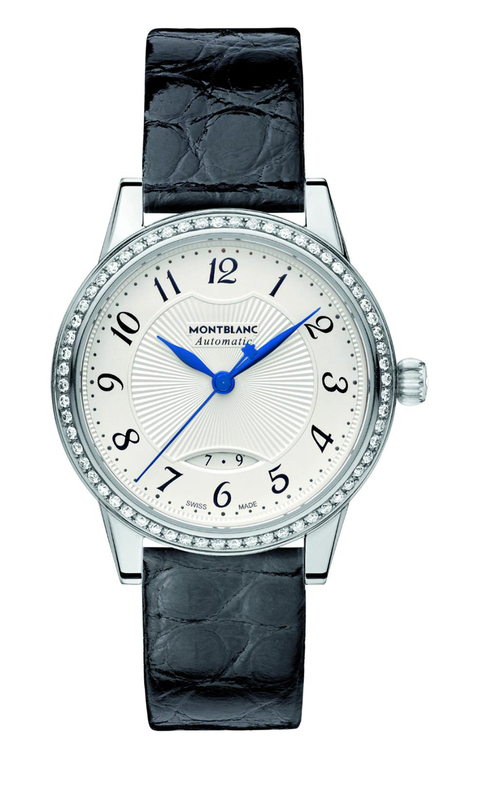 German writing insturments brand Mont Blanc keeps the Meisterstück tradition with their timepieces as well. The case, in stainless steel, measures 37mm x 9.5mm. The bezel features 62 Top Wesselton diamonds (0.45 carats). It has an AR-coated sapphire crystal and it is water resistant to 30 meters. Movement is the Swiss automatic Montblanc caliber MB 24.14 with 25 jewels, 28,800 vph and a power reserve of 38 hours. The dial is silver guilloché with black Arabic numerals and blued feuille and baton hands. It comes on a black alligator leather strap with a steel buckle.